You should have a list of photographers in your sketchbook that have been mentioned in class. Today you will choose five photographers to begin cataloguing. Create a folder on your Desktop titled CATALOGUE and within that folder create a separate folder with each photographer’s name. Search through online collections to download 5 examples of each person’s work. Save those images into the folder named for that photographer. Rename each file from 01 to 05. Then create a Microsoft Word file entitled Image List and save this to your photographer’s folder. In this document create a list 01 to 05 and for each image list the title, year, material, and dimensions. Happy researching! Dig deep! There are lots of images out there, dig through them to pick the ones that speak to you. ADVENTURES IN SPIRIT PHOTOGRAPHY: VICTORIAN GHOSTIES! An image of Master Herrod with a ghost. William H. Mumler, 1868. Mrs. Bentley and the spirit of her deceased sister, Wylie, c. 1920. Using the Flash and Burn technique we were able to have motion blur during our long exposure while using a quick burst from a bright flash to give us a crisp (though perhaps transparent) subject. Below are some examples of Victorian era "documentation" of ectoplasm conjured by mediums, Spiritualists, and enterprising photographers adept at in-camera manipulation and darkroom compositing. The medium Stanislawa P: emission and resorption of an ectoplasmic substance through the mouth. Albert von Schrenck-Notzing, silver gelatin print, 1913. Pictured on the left is Canadian Medium Mary Marshall as photographed by T.G. Hamilton in 1929. Dreamboat astronaut and all around Canadian Chris Hadfield talks about how to make awesome photographs in spaaaace! While we're on the subject of high speed photography and scientific applications of photography you have to check out this sweet animation that NASA put together of a volcanic eruption captured from the International Space Station. Click here to read more. Before Harold Edgerton there was Eadweard Muybridge (yes, I spelled that correctly). Muybridge melted the hearts and faces of nerds everywhere when in 1877 he designed a camera shutter that was able to expose an image for a mind blowing 1/1000 of a second. At the time this was crazy talk and he needed to perfect his emulsion to make his photographic plates highly sensitive to light since the shutter would be open for such a short period of time. Click on the image above to see more face-melting images of Muybridge's Animal Locomotion. Atomic bomb explosion photographed by Edgerton and his colleagues at EG&G, likely at the Nevada Proving Grounds, on commission for the Atomic Energy Commission; circa 1952. Alright so jumping away from reeeeeally long exposures let's talk about ridiculously short exposures. Like a millisecond. Like so fast that by the time YOU reached for your little camera the event captured was all ready over. Here we have Harry Edgerton's high-speed photographs of atomic tests. Commissioned by the Atomic Energy Commission Edgerton developed the Rapatronic shutter allowing a camera to capture incredibly high speed events. As an example, for the image above the shutter was only open for 1/100,000,000 of a second. This is the atomic explosion only a millisecond after the explosion before the iconic mushroom cloud stage that we associate with atomic explosions. Click on the image above for more information on Egerton's work. Okay now we're just getting ridiculous: this is essentially a 9 year long exposure. Okay its not quite a purely photographic image, its a data map of 9 years worth of data on Cosmic Microwave Background radiation. Again, microwaves are part of the Electromagnetic Spectrum of which light visible to our human eye is only a tiny fraction. Basically this image is looking so deep into space that it is able to see the so called cosmic Dark Ages and measure temperature fluctuations soon after the Big Bang- "soon" being 400 million years after the the Big Bang occurred. What did this show the super-nerds? That the universe is older than we thought (about 13.8 billion years old) and that at the time of these cosmic Dark Ages the universe was made up of about 95% dark matter and energy. My brain has melted and I'm not sure I've got this all correct so you should click on the image above to read more about it! Talk about long exposure! This shutter was open for a total of a million seconds to capture the faintest light thus revealing crazy distant galaxies. Click on the image to learn more! Section B inside the Camera Obscura. Section A inside the camera obscura. Now THAT is motion blur. Albelardo Morell. Camera Obscura: Manhattan View Looking South in Large Room, 1996. 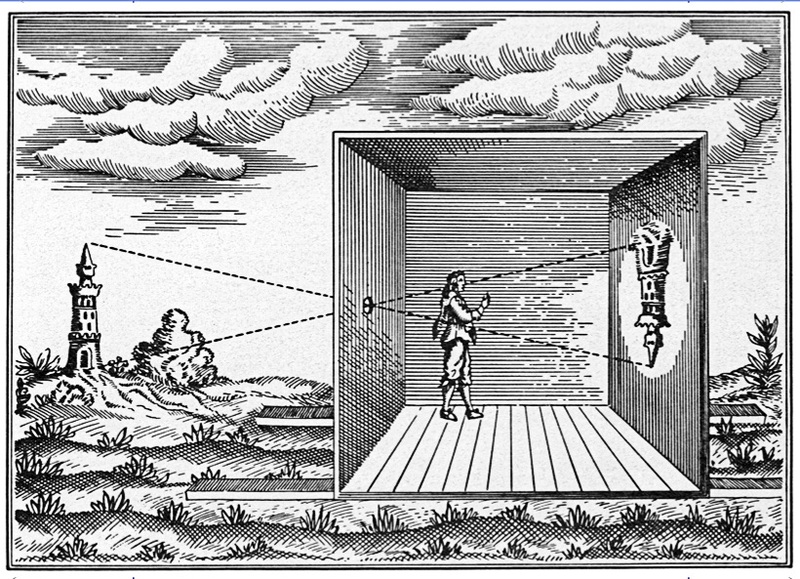 Light travels in a straight line and thus projects an upside down image on the focal plane of a camera obscura. Here is Carl Sagan in a clip from Cosmos describing our experience of dimensionality. Click here for the handout on how to upload your images via Image Capture. 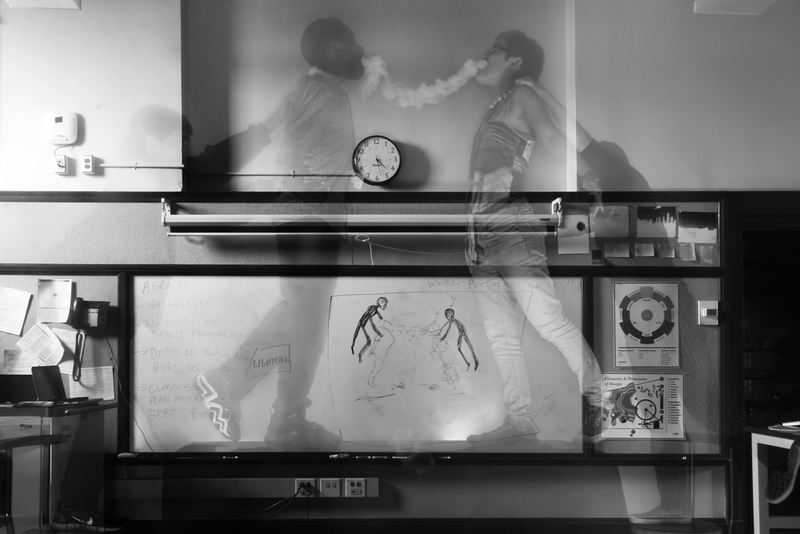 Your homework this week is to create a single long exposure. This must be: well focused, well composed, and well exposed. This must be made on the BULB shutter setting and must be at least 30 seconds long. This will work best on the Manual Focus setting. Edward Weston with his camera shortly after being awarded the Guggenheim Award. Click here for our Camera and Vision unit plan. Gerda Taro, Guadalajara Front, Spain. Unknown photographer, 1937. 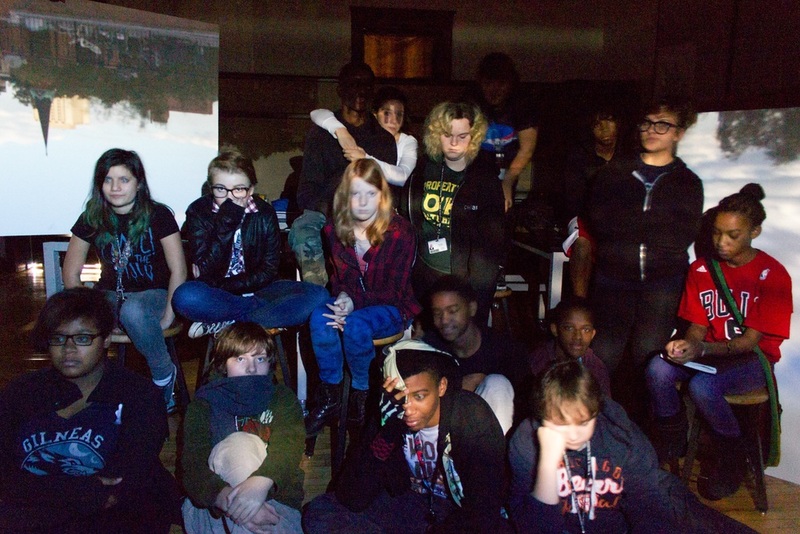 Welcome to the Photo-One class blog. Click here for to see our fall syllabus.